For some years Associates of the Schola have been joining with the YCA on a weekend retreat, usually in the autumn at Douai Abbey. The YCA is a group which promotes the spirit of orthodoxy with charity; it has a deliberately non-divisive outlook, and uses the Church’s devotional heritage in order to aid souls. It promotes celebration of Masses in the Extraordinary Form, Adoration, the Rosary, and other devotions. 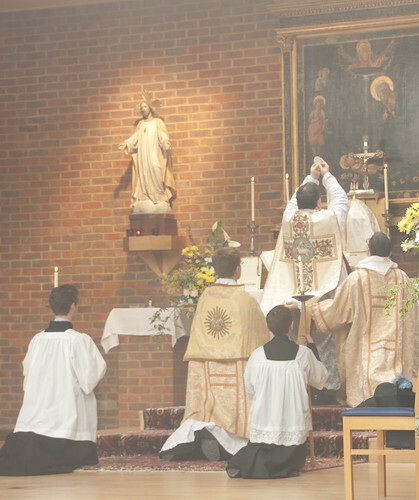 The YCA aims to promote a spirit of beauty and reverence in the Sacred Liturgy. This aim accords with the similar aim of the Schola to proclaim the word of God through the divinely inspired music of the chant. 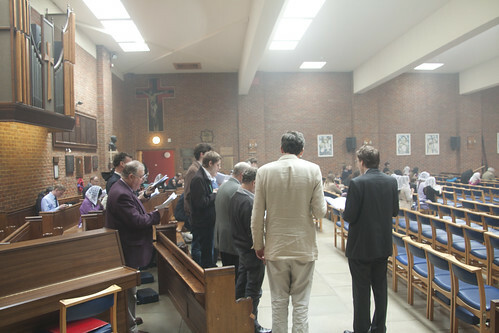 At these retreats the Schola leads the singing at Mass and the daily Offices, and encourages YCA members to join in rehearsals. 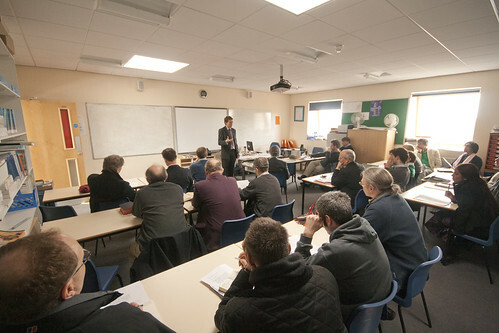 The lecture programmes of the YCA and Schola rehearsals are linked and timed to allow members of either organisation to attend both. Each day ends with a social gathering at which old friendships are renewed and new ones made. At the outset Christopher Hodkinson distributed music books covering the entire weekend, as usual beautifully prepared with translations alongside the Latin, coupled with full rubrics. On the Friday evening we sang Compline of the Feast of SS. Simon and Jude, ending with a Procession and Aspersion with Holy Water during the singing of the solemn Salve Regina. Next morning we sang the Mass of the Blessed Virgin Mary on Saturday (EF) at a High Mass in the parish church according to the Roman rite. Later in the morning rain curtailed the Marian Procession in the Abbey grounds in honour of Our Lady of Fatima. That evening we sang First Vespers of Our Lord Jesus Christ, King, and after supper Compline in the Abbey Church sung with the Community. On Sunday morning the Missa Cantata for the same Feast was celebrated in the parish church by Fr. 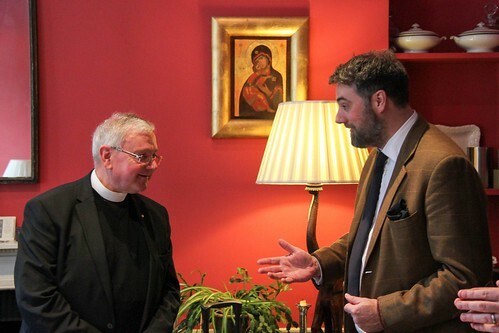 Thomas Crean, the Chaplain to the YCA, according to the Dominican rite. Douai Abbey is a splendid venue for these very successful retreats. Food and accommodation are excellent, and participants benefit from the peaceful atmosphere of the Abbey and the beautiful surrounding country. Everyone left hoping for a repeat visit next year. This is a new venture which I am pleased to bring to the attention of my readers. 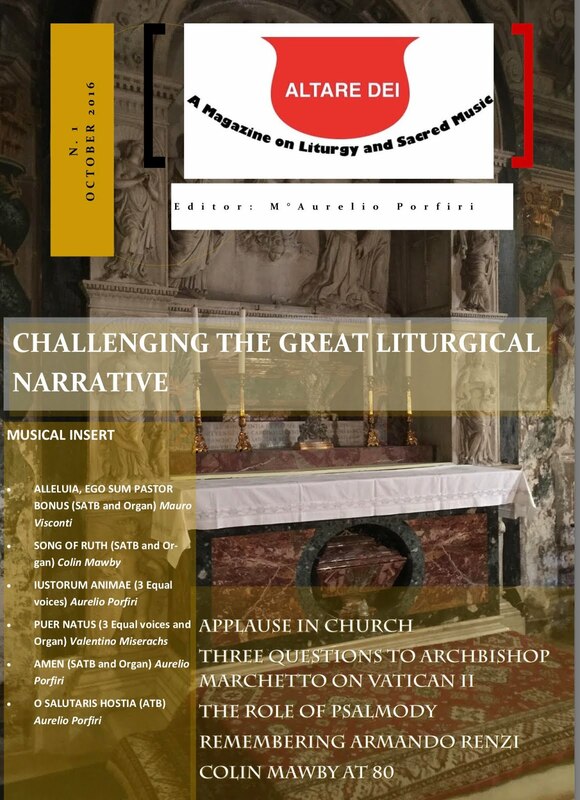 The first edition of this magazine includes both an intereview wuith and music by Colin Mawby, one of the Latin Mass Society's Patrons. You can buy and download it here. 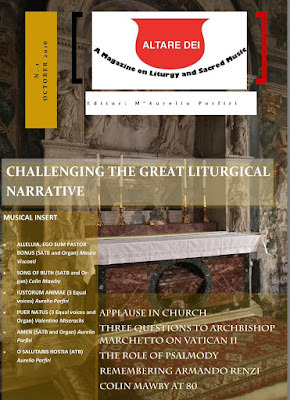 1) Altare Dei will present in English featured articles not only from people in the anglosaxon world, but also from Europe, theologians and liturgists that will be translated, sometimes for the first time in English. 2) The cost is around 7 US dollars, but if you consider only the musicla insert will cost much more than that if bought separately. 3) The musical insert has, in this issue 12 pages of music, 6 original pieces from contemporary very good Church composer. Only for that Altare Dei would be a must. 4) You can download the pdf right away, no shipping fees. Monsignor Gordon Read of Brentwood Diocese this year celebrates the 40th anniversary of his priestly ordination. As the National Chaplain of the Latin Mass Society, we made a little presentation to him at our annual get-together of Local Representatives in London. 1. Introductory workshop on liturgical plainsong at St Mary’s Cathedral, Aberdeen, on the afternoon of Saturday 12 November. The workshop is led by Benjamin Saunders, Diocesan Director of Music in Leeds diocese, who will also talk about the wonderful work he’s been doing to promote singing, especially among children, in Leeds and Bradford. Full details, including how to reserve a place, here: http://www.dioceseofaberdeen.org/archives/8341. 2. 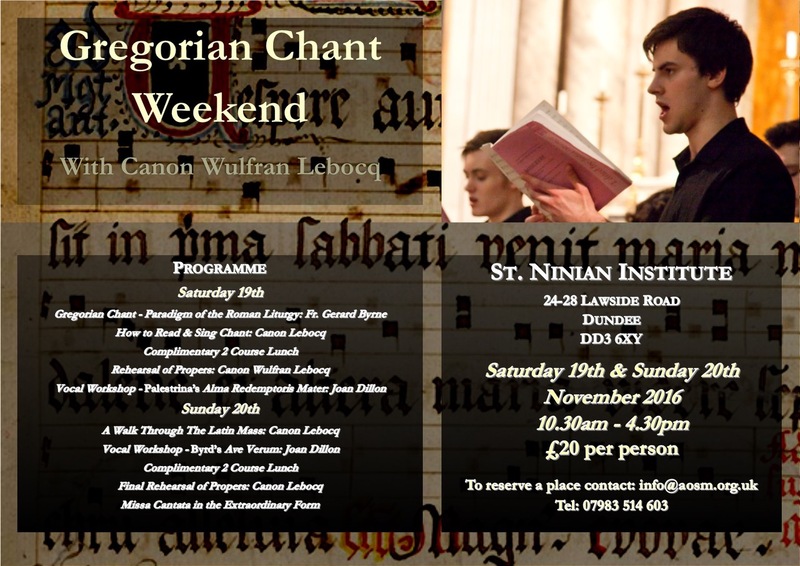 Gregorian Chant Weekend at the St. Ninian Institute, Dundee, 19-20 November: see the poster below for details (click on the picture to make it full size). The Institute is very happy to provide overnight accommodation for participants who may need it - the rate is £30 per person, per night on a B&B basis. Lunch will be provided as part of the course. As part of the Yorkshire Medieval Churches (Church Explorers) Festival 2016, and to commemorate the 800th anniversary of the Dominican order, the Rudgate Schola are going to be singing Compline by candlelight using the old Dominican Rite (with its processions) each evening from Sunday 21st August to Friday 26th August at 8.30pm. On the final day, 27th August, they shall sing Vespers using the Roman Rite (Extraordinary Form) at 3.30pm and conclude with Dominican Compline at 8pm. The venue for all of this is St Mary's Church (the oldest in York), Bishophill Junior, York YO1 6EN. As about a quarter of this blog's page-views come from North America, I think it worth mentioning this forthcoming event in Canada. It is going to be a wonderful time, focusing on practical chant singing, but also with a series of lectures on chant in honour of the late Dr. Andrew Hughes, who did so much to further research in Gregorian Chant. Our guest clinician is Adam Bartlett, who will also be directing the chant for the Sunday mass. There will also be sung offices each day, a banquet, and a concert. All events are at the beautiful St. Augustine's Seminary. http://www.gregorian.ca/wp/index.php/colloquium-2016/for full program information, registration, and accommodation. I would add that the line-up of speakers looks most impressive. After a gap of two years, we were able to organise a residential Chant Weekend again this year, in parallel with the St Catherine's Trust Family Retreat. It was led by Colin Mawby and Chris Hodkinson; a dozen singers attended. As usual, the singers on the course were able to accompany the liturgies of the event, three Masses, Vespers and Benediction, two Complines, and a procession of thanksgiving: which, in accordance with tradition, started with the Te Deum and concluded with the Canticle of Zachary. So there was plenty of live, liturgical singing, with an appreciative congregation, as well as practice, theoretical discussion, and a session on organ accompaniment of chant. The Family Retreat was also very successful, and the combined event attracted more than 90 people. The Retreat was led by two yound priests from the community on Papa Stronsay in the Orkneys, the Sons of the Holy Redeemer: Fr Magdala Marie F.SS.R and Fr Jean Marie F.SS.R.. 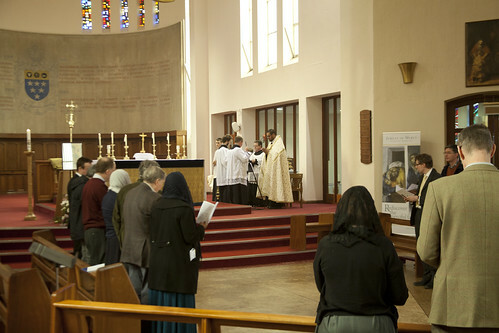 Both the Retreat and the Chant course were sponsored by the Latin Mass Society. Palm Sunday: The Gradual (Gregorian, with simplified psalm tone verse). Palm Sunday: The Tract (Gregorian, with alternating psalm tone and organum verses). Easter Sunday: Gregorian/Polyphonic Gradual. 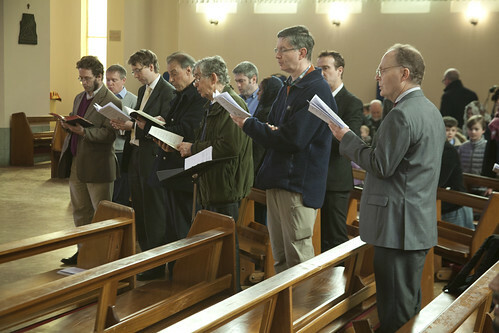 Alastair has prepared a new edition of the Gradual - Haec dies - for Easter Sunday in which the Respond (the initial portion) is sung in Gregorian chant but with the Verse sung in a simple four-part setting by Cesare de Zacharia (circa.1594). The edition is available free for liturgical use. Easter Sunday: Gregorian/Polyphonic Alleluia. He has also prepared a new edition of the Alleluia - Pascha nostrum - for Easter Sunday in which the initial Alleluia is sung in Gregorian chant, the verse is sung to a simple psalm tone (VII), and the final Alleluia is sung in a simple four-part setting by Giuseppe Pitoni (1657-1743). The edition is free for liturgical use. Many thanks to Alastair for sharing these, and best wishes to all of you who are currently preparing music for the Holy Week and Easter liturgies. 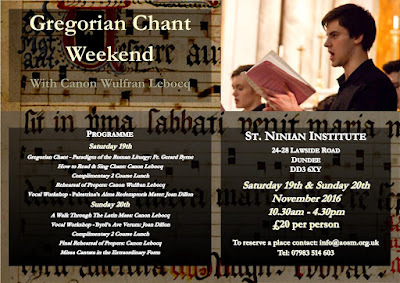 The Gregorian Chant Network's annual big chant course - a three-day intensive course (Friday afternoon/evening to Sunday morning) - will take place 1st to 3rd April 2016. 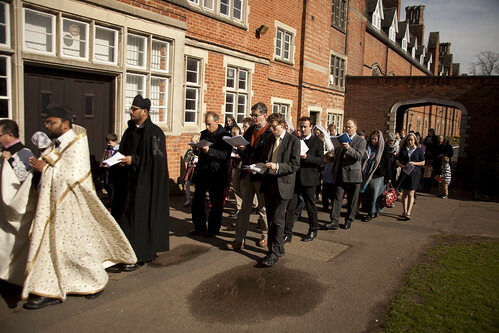 That is, Easter Friday to Low Sunday, the weekend after Easter itself, at Ratcliffe College, near Leicester. It will be led by Colin Mawby, the well known composer, and Christopher Hodkinson, one of the Musical Directors of the Schola Gregoriana of Cambridge. The course has always run alongside the St Catherine's Trust Family Retreat. Apart from seeing the vast number of small children devoted to the Church ancient liturgy, which is always fun, this means that participants in the chant course have the opportunity to sing at a succession of live liturgical events with an appreciative audience. Each of the three days has a Traditional High Mass, which have a special interest because it will be the week after Easter. There is also Compline on two days, and Vespers and Benediction on the Saturday. The Retreat this year will be led by two priests of the Sons of the Holy Redeemer from Papa Stronsay, Fr Magdala F.SS.R and Fr Jean F.SS.R . The earliest forms of chant notation show various signs called neumes "in campo aperto", that is, without any ruled staff-lines to indicate pitch; "in campo aperto" means "in an open field".